Pope Francis arrived in the UAE on Sunday night, for a landmark three-day visit to the UAE. It is the first time a pontiff has visited the GCC. He was received at the airport in Abu Dhabi by Abu Dhabi Crown Prince Sheikh Mohamed bin Zayed Al Nahyan and Dr Ahmad Al Tayyeb, Grand Imam of Al Azhar Al Sharif, who had arrived earlier on Sunday. The Pope was greeted by a number of children lined up with bouquets of roses, according to state news agency, wam. 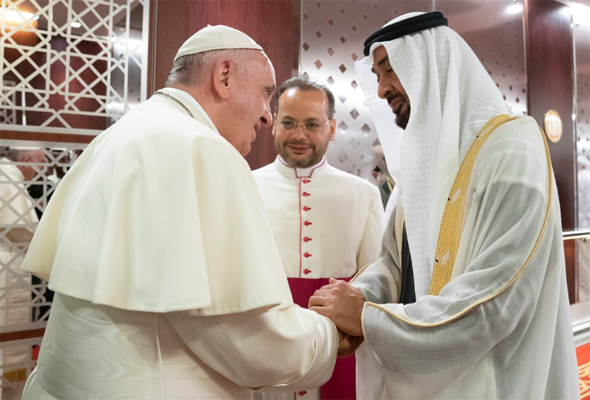 “We are honoured to welcome our state guests, Poope Francis Head of the Catholic Church and Dr Ahmad Al Tayyeb Grand Imam of Al Azhar Al Sharif,” Abu Dhabi’s Crown Prince said in a Tweet. “The flourishing of love, tolerance is a tribute to this blessed land and Sheikh Zayed’s vision of the UAE as an oasis of human coexistence,” he finished the message. Sheikh Mohamed bin Zayed also went on to further Tweet that “The leadership & nation of the UAE are proud of this historic visit of two greatly respected religious figures. It embodies our belief in the values of love & tolerance as a pathway for humanity towards peace, security, stability & rapprochement between different people & culture,” Sheikh Mohamed concluded. 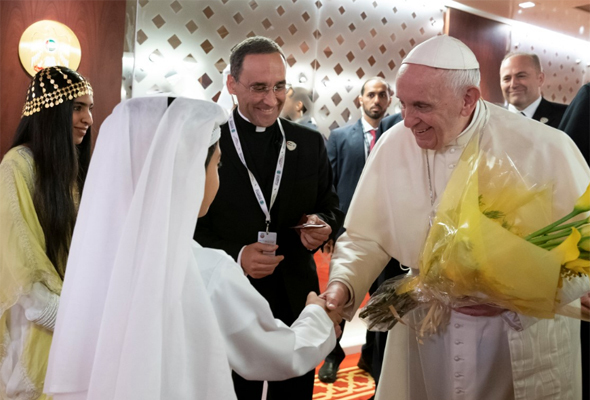 Pope Francis is in the UAE for a three day visit, which will see the Pope will hold meetings with Sheikh Mohamed and Sheikh Ahmad as part of an interfaith meeting. His visit will also include a visit to the Grand Mosque, before celebrating with a Holy Mass at Abu Dhabi’s Zayed Sports City Stadium, which around 135,000 Catholics are expected to attend.